Numbers don’t define Tom Brookens, but one has to start somewhere. Third base was his primary home for 10 major-league seasons with the Detroit Tigers, starting on July 10, 1979, through the 1988 season, followed by one-year stints with the New York Yankees and Cleveland Indians. His last major-league game was on September 30, 1990. Brookens played 1,206 games for the Tigers, 113 of them in the memorable 1984 season that garnered a World Series championship. During his Detroit career he played in 978 games at third base. In 1984 he backed up Alan Trammell at shortstop for 28 games, and Lou Whitaker at second base 26 times. In 1985, he even caught five innings for the Tigers and eventually played every position for Detroit except left field and pitcher. Many refer to Brookens as a fan favorite. One Brookens admirer posted on the baseballfever.com Web site: “The man may not have had the best bat or glove, but you had to love his desire and hustle, the spectacles, and of course, that ’stache.” Brookens, during a 2008 interview, disclosed a belated scoop of sorts. His photo from the 1980 Detroit Tigers Yearbook shows him clean-shaven. How can this be? Blame manager Sparky Anderson: “That was Sparky’s rule, when I first got to Detroit in 1979. Originally Sparky had a rule – no mustaches allowed – and then in 1980 he really let loose. I had a mustache (in the minors) the day I was called up, and shaved the day I got to Tiger Stadium.” Most times since 1980, though, Brookens’ face has borne his trademark whiskers. Born Thomas Dale Brookens on August 10, 1953, in Chambersburg, Pennsylvania, he quickly made Fayetteville, a town outside Chambersburg, his home. Brookens married Krista Schoenfelt on New Year’s Eve in 1976. “I knew her in high school and she’s still puttin’ up with me.” Their union produced three daughters. “In my hometown, Fayetteville, baseball was the thing for kids to do in the summertime. Baseball, it was always baseball,” he said. “My dad was never a professional player but he was a sandlot player, a dairy farmer. I grew up on a farm and my mom worked at the elementary school as a cook.” Baseball was a family affair for the Brookenses. Tom’s identical twin brother, Tim, though drafted by Texas, played in Detroit’s minor-league system. Ike Brookens, a cousin, pitched in the Detroit organization in the early 1970s and got into three games with the Tigers in 1975. Attracting attention at Mansfield (Pennsylvania) State College (now Mansfield University), Brookens was the Tigers’ first-round pick — fourth overall — in the January 1975, draft. “That’s a little misleading, because everybody says you were a first-round pick, but I was taken in the January supplemental draft,” Brookens said in typical modest fashion. “There might have only been 10 guys drafted in that whole draft, I don’t know.” Actually, future Tigers teammates Dave Rozema (fourth round) and Dave Tobik (first round, second pick overall) were picked in that draft; so too was Tigers teammate Ed Putman, the first-round (third overall) pick of the Chicago Cubs. Rozema was a key clubhouse figure on the 1984 team, with a carefree attitude the near polar opposite of Brookens’ grind-it-out persona. Tobik, after parts of five years in a Detroit uniform, was an opposing pitcher in one of Brookens’ best days as a major leaguer; Tom went 4-for-4 against the Texas Rangers on May 22, 1983, with an eighth-inning home run off Tobik. But before the majors, Brookens toiled for 4½ seasons in the Detroit farm system. He started in that summer of 1975 in Montgomery, Alabama, appearing in 100 games for the Double-A Rebels, and stayed in Montgomery in 1976 for 137 more games, showing speed on the basepaths, making improvements across the board — batting, runs, RBIs, doubles, triples, homers, walks, and steals — and demonstrating his ability to play any infield position. That earned Brookens a promotion for 1977 to the Triple-A Evansville Triplets, where he showed he belonged, batting a solid .289 in 118 games, scoring 70 runs, and knocking in 52, while stealing 18 bases against better trained pitchers. Seventy-seven games into the 1979 season, Brookens was hitting .306, with 14 home runs and 46 RBIs, for manager Jim Leyland’s Evansville Triplets. It was this level of performance that paved the way for his promotion to Detroit on July 10, 1979. Aurelio Rodriguez’s backup, Phil Mankowski, had played with Brookens in Montgomery, but broke a finger and had to be put on the disabled list. That gave Brookens an opening with the Tigers, in large part because of Leyland’s recommendation. The rest of the Detroit brass wanted to go outside the organization and get Jim Morrison of the Philadelphia Phillies — Morrison finally got to Detroit in a mid-1987 trade — but Leyland suggested they give Brookens a shot because of the year he was having at Evansville. “When I played for [Leyland] at Evansville, I wasn’t the only one who thought [his] next stop would be managing the Tigers.” Brookens said. “I’ve always appreciated [his recommending me]. But frankly, I thought it wouldn’t be long before I was playing for him and we’d both be in Detroit. Then the Sparky [Anderson hiring] happened, and Jim kind of got lost in the shuffle.” Leyland finally got his chance, being hired for 2006 and taking the Tigers to the World Series his first year at the helm. Brookens’ first major-league game — and base hit — occurred on the night of his call-up, July 10, at Tiger Stadium. His debut single came off Minnesota’s Geoff Zahn to left field in the second inning; then Brookens was the subject of a pickoff attempt but advanced to second on Zahn’s errant throw. Moments later Brookens was caught trying to steal third. Nevertheless, the Tigers won, 6-5. Brookens had a better baserunning experience five days later against the Chicago White Sox, on July 15 at Comiskey Park. In the second inning he hit an RBI single scoring Lance Parrish, stole second, advanced to third on a throwing error by catcher Milt May, and finally stole home with Trammell at the plate. The San Diego Padres purchased Rodriguez’s contract after the 1979 season, and the Tigers traded Mankowski to the New York Mets along with outfielder Jerry Morales for third baseman Richie Hebner. In 1980, his first season as a regular, and most frequently batting in the eighth spot, the 26-year- old Brookens hit a career-high .275 with 25 doubles, nine triples and 10 home runs. He drove in 66 runs. His range was very good at third, as it was most of his career, but he made 29 errors. Brookens’ best game came on August 20, 1980. He started a triple play and went 5-for-5 on the road against the Milwaukee Brewers in an 8-6 Detroit win. Brookens earned the respect of most fans but some — including those in the Detroit brass — never accepted his solid glove and light bat as good enough. 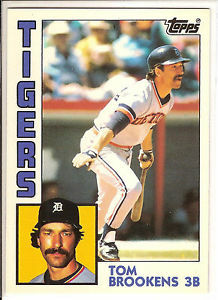 Though the young Tigers team was built around Trammell, Whitaker, and Parrish, Brookens became the closest thing to a regular third baseman that the Tigers had during the 1980s. Still, that didn’t stop Sparky Anderson from trying to find more offense from the hot corner. Among the third basemen Sparky looked to replace Brookens with were Glenn Wilson (in a 1984 spring-training game that made Wilson even more determined to bolt from Detroit), Barbaro Garbey, Howard Johnson, Marty Castillo, Darrell Evans, Darnell Coles, Chris Pittaro, Lou Whitaker (spring 1985, with Anderson-anointed wunderkind Pittaro at second), Enos Cabell, Wayne Krenchicki, Jim Morrison, Ray Knight, and Luis Salazar. Brookens had a great 4-for-5 day against the Yankees in New York on April 12, 1983, in a 13-2 whipping. On September 22 the Tigers, keyed by two Brookens hits, sent a late season “wait till next year” message to the eventual 1983 world champion Orioles with 5-4 win. Brookens’ most memorable season was with that 1984 Tigers team with its 35-5 start. His personal start wasn’t nearly as good as the team’s. He started the season 0-for-12 in the first seven games he played, all Detroit wins. He got a couple of hits on April 13 at Boston in a 13-9 win, but didn’t get another at-bat until April 18 when he got two more hits to double his season total. But the die had been cast; Sparky would use switch-hitting Howard Johnson for 108 games at third, and Brookens would also share time at the position with Marty Castillo, Barbaro Garbey, and Darrell Evans. Though not a full-time starter, Brookens appeared in 68 games at third and proved an indispensible utilityman for Detroit, appearing in 28 games at shortstop and 26 at second base. If one game during the Tigers’ incredible start typified Brookens’ team-oriented contributions, it was against the Indians on May 6. Playing in Cleveland’s Municipal Stadium, the Tigers came from four runs down to tie the score in the top of the eighth. Brookens came in as a defensive replacement and was asked to lay down two sacrifice bunts, the second of which put the eventual winning run in scoring position. The Tigers won the game, 6-5, raising their record to 22-4. Brookens hit a key two-run triple on June 17, 1984, keying a sweep of the Brewers at home. Five days later he once again victimized Milwaukee. This time he went 2-for-2 with an RBI in the Tigers’ 7-3 win. Brookens opened August with one of his few bad games, making two errors at shortstop and wasting a good effort by Dan Petry in a 4-2 loss to Cleveland. However, Brookens shook off the miscues almost immediately. Two days later he hit a home run against the Kansas City Royals in a loss. On August 6 in the opening tilt of a doubleheader at Boston, Brookens started off with a solo shot and scored two runs in a tight 9-7 Tigers victory. In the second game he got two hits and scored a run off a rookie named Roger Clemens in a 4-2 Tigers loss. (Brookens hit a career .375 off Clemens.) On August 15 Brookens came through for Petry, going 3-for-3 plus a sacrifice bunt with two RBIs in an 8-3 home win against the Angels. As they had at the beginning of the season, the Tigers got off to a quick start on September 16. Brookens was one of four Tigers who hit homers in a 8-3 victory over the second-place Toronto Blue Jays. “That series was the clinching blow that won it for us,” Brookens said. Detroit had vanquished its closest foes and had come just shy of taking the American League East title in their presence. But he wasn’t done contributing yet. In the seventh inning of the division-clinching win, against the Brewers on September 18, Brookens hit a solo homer for Detroit’s final run in the 3-0 win. After the Tigers clinched the division, Brookens started only two more games that season, both in the final weekend. Physical woes kept him from starting, but not from getting a spot on the postseason roster. Brookens played in the first two games of the 1984 American League Championship Series against Kansas City and in Games One, Two, and Four of the 1984 World Series. Brookens had another big day against a Hall of Fame pitcher in 1985, when Don Sutton started but didn’t stay long, as Brookens went 4-for-5 with an RBI single on May 17 at Oakland in a 10-2 Tigers victory over the A’s. This great day at the plate is also memorable in another respect: In the Tigers’ half of the ninth inning, a Brookens-batted ball hit the umpire and stayed in his coat. On the same date in 1987, Brookens put the hurt on another Hall of Fame pitcher, taking Cleveland’s Steve Carlton deep for a home run. Brookens again whacked a Carlton pitch over the left-field wall in the first inning of a game on August 18, 1987, when Carlton’s hanging-on tour of the majors was sputtering to a stop and the Tigers were neck-and-neck with Toronto for the American League East flag. On September 23 Brookens keyed a must-win game at Boston with two doubles. The Tigers finally shook off the Blue Jays, sweeping them on the last weekend of the season in Tiger Stadium, but ran up against the eventual world-champion Minnesota Twins in a very loud Metrodome. “We were disappointed that we ended up getting beat by Minnesota, but they had a nice ballclub too and ended up winning the World Series,” Brookens said. He remembered the Metrodome as “something else, I’m playing third base and hollering at Jack Morris on the mound, and he can’t hear me. That place gets rockin’, and usually not in your favor.” In all, Brookens was hitless in 13 postseason at-bats. In his final year with the Tigers, 1988, Brookens batted in six Tigers runs on June 14, going 4-for-4 with a double and a second-inning grand slam off the Orioles’ Dickie Noles, who had been a Tigers teammate at the tail end of the ’87 season. In spring training 1989, Chris “Tin Man” Brown came to Detroit with Keith Moreland from San Diego for pitcher Walt Terrell and was handed the starting third-base job. Before spring training was over, Brookens was dealt to the Yankees; Brown was such a bust that the Tigers released him in mid-May. “Sparky called me in to the office and told me I’d been traded to the Yankees for Charlie Hudson,” he remembered. “[I] spent that season with the Yankees, was released by them at the end of the year. Cleveland signed me to a one-year deal in 1990, and then I retired at the end of that year.” By the time he hung up his spikes, Brookens had played in 1,336 games — all but 130 for Detroit — and hit .246 with 175 doubles, 40 triples, and 71 home runs. Brookens was an accomplished darts player as a young man growing up in Pennsylvania, and in his offseasons and retirement years he liked to use guns and a bow to hunt turkey and deer. He also played golf in the warm weather, especially with many of his former teammates while in Lakeland for the Tigers’ fantasy camp. Brookens was out of the game after his retirement following the 1990 season and was committed to staying close to home while his young daughters grew to college age during the 1990s, but he held out some hope that he could return to the game, and the Tigers called in 2005, hiring him to manage the Oneonta Tigers, their short-season A-ball affiliate in the New York-Penn League. The club earned a playoff spot in 2005. After 2006 the Tigers rewarded Brookens with a promotion to the Class A West Michigan Whitecaps in 2007; the club won the Midwest League title in that year. In 2008 he became manager of his third minor-league team in four years, the Erie SeaWolves of the Double-A Eastern League, landing one playoff appearance in his two seasons there. Brookens’ performance in the Tigers’ minor-league system helped him land a position on manager Jim Leyland’s staff as first base, outfield, and baserunning coach for the 2010 season. This biography originally appeared in "Detroit Tigers 1984: What A Start! What A Finish!" (SABR, 2012), edited by Mark Pattison and David Raglin. Thanks to the Mayo Smith Society and of course to Tom Brookens for granting us the interview. Falls, Joe. Detroit Tigers: An Illustrated History. New York: Prentice-Hall, 1989. Middlesworth, Hal, ed. Detroit Tigers 1980 Yearbook. Detroit: Detroit Tigers. 1980. Pattison, Mark, and David Raglin. Detroit Tigers Lists and More: Runs, Hits and Eras. Detroit: Wayne State University Press. 2002. Hilliard, Larry, and Pat Kilroy. Interview with Tom Brookens, April 5, 2008, in Bowie, Maryland.